Stephen Regan was born in Durham and has worked in the Department of English Studies since 2004. He was Head of Department from 2008 to 2011. Previously, he was Lecturer in Modern Poetry at Royal Holloway, University of London, and also worked at Ruskin College, Oxford and The Open University. He was a Visiting Scholar in the Department of English at Harvard University in 2011-12. He has worked for the British Council in Poland, former Yugoslavia, Morocco, and Tunisia. His main teaching and research interests are modern poetry, modern Irish literature and literary theory. His publications include essays on W.B.Yeats, Seamus Heaney and Robert Frost, two books on Philip Larkin, and an edition of George Meredith's Modern Love. His most recent book is The Sonnet, the first comprehensive study of the sonnet form in English poetry, published by Oxford University Press in 2019. He is the editor of Irish Writing: An Anthology of Irish Literature in English 1789-1939 in the Oxford World's Classics series. Stephen Regan is Director of The Centre for Poetry and Poetics, which encourages research on the Basil Bunting Archive and other poetry archives in the Palace Green Library at Durham. He would welcome enquiries from researchers interested in working on modern British, Irish and American poetry. Regan, S. (2019). The Sonnet. Oxford University Press. Regan, S. (2016). '"Door into the Light": The Later Poems of Seamus Heaney'. In "The Soul Exceeds Its Circumstances": The Later Poetry of Seamus Heaney. O'Brien, Eugene Notre Dame, Indiana: University of Notre Dame Press. 261-278. Regan, S. (2016). 'The Art of Losing: American Elegy Since 1945.'. In American Poetry Since 1945. Spencer, Eleanor Palgrave Macmillan. 183-202. Regan, S. (2013). Auden and Shakespeare. In W.H. Auden in Context. Sharpe, Tony. Cambridge University Press. 266-275. Regan, S. (2012). '"Coming up England by a different line": Louis MacNeice and Philip Larkin'. In Incorrigibly Plural: Louis MacNeice and his Legacy. Brearton, Fran & Longley, Edna. Carcanet. 241-256. Regan, S. (2012). 'Irish Elegy after Yeats'. In Oxford Handbook of Modern Irish Poetry. Brearton, Fran & Gillis, Alan. Oxford: Oxford University Press. 588-606. Regan, S. (2011). Contemporary and post-war poetry. In T.S. Eliot in Context. Harding, Jason. Cambridge University Press. Regan, S. (2010). '"Crisis first-hand": Seamus Heaney before and after the Ceasefire'. In Crisis and Contemporary Poetry. Karhio, Anne, Crosson, Sean & Armstrong, Charles. Palgrave Macmillan. 99-113. Regan, S. (2010). 'Later Poetry'. In W.B. Yeats. Larrissy, Edward. Dublin: Irish Academic Press. 75-92. Regan,S. (2010). 'Mahon, Longley, Muldoon, McGuckian, Carson, Boland and other Irish Poets'. In The Cambridge History of English Poetry. O'Neill, Michael. Cambridge: Cambridge University Press. 956-970. Regan, S. (2010). 'Philip Larkin and the Movement'. In The Cambridge History of English Poetry. O'Neill, Michael. Cambridge: Cambridge University Press. 879-896. Regan, S. (2009). 'Sacred Spaces: Writing Home in Recent Irish Memoirs and Autobiographies'. In Irish Literature Since 1990. Brewster, Scott. & Parker, Michael Manchester: Manchester University Press. 232-249. Regan, S. (2009). 'The Darkening Pastoral: Under the Greenwood Tree and Far from the Madding Crowd'. In A Companion to Thomas Hardy. Wilson, Keith. Oxford: Blackwell. 241-253. Regan, S. (2009). 'Yeats and the fin de siecle'. In Yeats in Context. Holdeman, David & Levitas, Ben. Cambridge: Cambridge University Press. 25-34. Regan, S. (2008). 'Philip Larkin: A Late Modern Poet'. In The Cambridge Companion to Twentieth-Century English Poetry. Corcoran, Neil. Cambridge: Cambridge University Press. 147-158. Regan, S. (2007). 'Seamus Heaney and the Modern Irish Elegy'. In Seamus Heaney: Poet, Critic, Translator. Crowder, A.B. & Hall, J. Basingstoke: Palgrave Macmillan. 9-25. Regan, S. (2006). 'The Falling Angels: Identity and Place in Contemporary Irish Autobiography'. In Language and Identity: English and American Studies in the Age of Globalization. Mazur, Zygmunt & Bela, Teresa. Krakow: Jagiellonian University Press. 382-390. Regan, S. (2004). ‘Terry Eagleton’. In The Johns Hopkins Guide to Literary Theory and Criticism. Baltimore: Johns Hopkins University Press. Regan.S. (2001). 'Far from the Madding Crowd: The Novel in History'. In The Nineteenth-Century Novel: Realisms. Da Sousa Correa, D. London: Routledge. 330-357. Regan, S. (2001). 'Far from the Madding Crowd: Vision and Design'. In The Nineteenth-Century Novel: Realisms. Da Sousa Correa, D. London: Routledge. 296-329. Regan, S. (2001). ‘The Movement’. In A Companion to Twentieth-Century Poetry. Roberts, N. Oxford: Blackwell. pp. 209-20. Regan, S. (2000). 'In the Grip of Light: Philip Larkin's Poetry of the 1940s'. In New Larkins for Old. Booth, J. Basingstoke: Macmillan. 121-129. Regan, S. & Martin, G. (2000). 'King Lear. In Shakespeare: Texts and Contexts. Ryan, K. Basingstoke: Macmillan. 241-75. Regan, S. (2000). 'Macbeth'. In Shakespeare: Texts and Contexts. Ryan, K. Basingstoke: Macmillan. 81-123. Regan, S. (2000). 'Poetry and Nation: W.B. Yeats'. In Literature and Nation: Britain and India 1800-1990. Allen, R. & Trivedi, H. London: Routledge. 78-94. Regan, S. (1998). 'Form and Meaning in Poetry: The Sonnet'. In An Introduction to the Humanities. Milton Keynes: Open University. 49-93. Regan, S. (1998). 'Reader-Response Criticism and Reception Theory'. In A Handbook of Literary Research. Owens, W.R. & Eliot, S. London: Routledge. 139-149. Regan, S. (1998). 'The Celtic Spirit in Literature: Ernest Renan, Matthew Arnold, and W.B. Yeats'. In Irish Encounters. Marshall, A. & Sammells, N. Bath: Sulis Press. 28-40. Regan, S. (1997). 'Larkin's Reputation'. In Larkin with Poetry. Baron, M. London: English Association. 47-69. Regan, S. (1995). 'The Novel and Society'. In The Realist Novel. Walder, D. London: Routledge. 98-107. Regan, S. (1995). 'W.B. Yeats and Irish Cultural Politics in the 1890s'. In Cultural Politics at the fin de siecle. Ledger, S. & McCracken, S. Cambridge: Cambridge University Press. 66-84. Regan, S. (1991). 'The Presence of the Past: Modernism and Postmodernism in Canadian Short Fiction'. In Narrative Strategies in Canadian Literature. Howells, C. & Hunter, L. Buckingham: Open University Press. 108-33. Regan, S. (1990). '"Oil and Blood": Yeats's Return to the Nineties'. In Yeats Annual. Gould, W. Basingstoke: Macmillan. 7: 194-99. Regan, S. (2012). George Moore Esther Waters. Oxford World's Classics. Oxford University Press. Regan, S. & Allen, R. (2008). Irelands of the Mind: Memory and Identity in Modern Irish Culture. Newcastle upon Tyne: Cambridge Scholars. Regan, S. (2004). 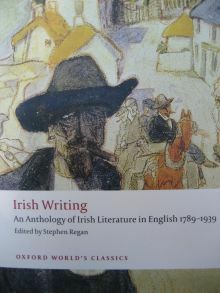 Irish Writing: An Anthology of Irish Literature in English 1789-1939. Oxford World's Classics. Oxford: Oxford University Press. Regan, S. (2001). The Nineteenth-Century Novel: A Critical Reader. London: Routledge. Regan, S. (1998). The Eagleton Reader. Oxford: Blackwell. Regan, S. (1997). Philip Larkin. New Casebooks. Basingstoke: Macmillan. Regan, S. (1992). The Politics of Pleasure: Aesthetics and Cultural Theory. Buckingham: Open University Press. Regan, S. (1988). George Meredith: Modern Love. Peterborough: Monitor House. Regan, S. (1996). The Year's Work in Critical and Cultural Theory, 2. Blackwell. Regan, S. (1994). The Year's Work in Critical and Cultural Theory, 1. Blackwell. Regan, S. & Treharne, E. (1991). The Year's Work in English Studies, 72. Blackwell. Regan, Stephen (2019). Landscapes of mourning in nineteenth-century English poetry. Nineteenth-Century Contexts 41(1): 23-33. Regan, Stephen (2017). The Sonnet and its Travels. CounterText 3(2): 162-175. Regan, S. (2016). 'Lux Perpetua: The Poetry of Seamus Heaney, from Door into the Dark to Electric Light'. Romanticism 22(3): 322-330. Regan, S. (2015). 'Seamus Heaney and the Making of Sweeney Astray'. Hungarian Journal of English and American Studies 21(2): 317-40. Regan, S. (2014). '"Things Remembered": Objects of Memory in the Poetry of Seamus Heaney'. Éire-Ireland 49(3/4): 320-336. Regan, S. (2009). 'North of Boston: Models of Identity, Subjectivity and Place in the Poems of Robert Frost'. Romanticism and Victorianism on the Net 51. Regan, S. (2006). 'The Victorian Sonnet, from George Meredith to Gerard Manley Hopkins.'. The Yearbook of English Studies 36(2): 17-34. Regan, S. (2006). 'W.B. Yeats: Irish Nationalism and Post-Colonial Theory'. Nordic Irish Studies 5(1): 87-100. Regan, S. (2005). 'Robert Frost and the American Sonnet'. The Robert Frost Review 14: 13-35. Regan, S. & Goodman, L. (1998). '"Scorned as Timber, Beloved of the Sky": Emily Carr's double approach to First Nations Canadian landscapes and images in her painting and writing'. Journal of Gender Studies 7(2): 157-179. Regan, S. (1997). 'Seamus Deane: Reading in the Dark'. Irish Studies Review 19: 35-40. Regan, S. (1996). 'Neil Jordan: Michael Collins'. Irish Studies Review 17: 40-43. Regan, S. (1995). 'Brian Friel's Translations'. English Review 6: 38-41. Regan, S. (1993). 'W.B. Yeats: "Sailing to Byzantium"'. English Review 4: 23-35. Regan, S. (1992). 'Ireland's Field Day'. History Workshop Journal (33): 25-37. Regan, S. (1987). The Nineteenth Century: Victorian Period (Verse). The Year's Work in English Studies 68: 408-433. Regan, S. (1986). The Nineteenth Century: Victorian Period (Verse). The Year's Work in English Studies 67: 374-395. Regan, S. (1985). The Nineteenth Century: Victorian Period (Verse). The Year's Work in English Studies 66: 366-391. Regan, S. (1984). The Nineteenth Century: Victorian Period (Verse). The Year's Work in English Studies 65: 416-449.